In recent times, with a better understanding of the pathophysiology of various retinal conditions, such as age-related macular degeneration, diabetic macular edema, and retinal vein occlusion, it is now known that vascular endothelial growth factor (VEGF) plays a pivotal role in the pathogenesis of these conditions. Hence, anti-VEGF agents are often the first-line drugs which have shown to improve visual acuity, rather than just prevent vision loss. The paradigm shift in the management of these conditions is evident by the fact that intravitreal injections have become the most common medical procedure in the United States (about twice the cataract surgery). The intraocular use of multidose Avastin proves to be the cheapest and most cost-effective besides its high efficacy. However, it is “off-label” as it is not approved by the Food and Drug Administration, USA nor by the drug controller general of India for intravitreal use. This has led to a lot of debate and doubts regarding legal implications of the use of intravitreal Avastin ®, procurement of the drug, precautions to be taken, and guidelines to be followed while using the vial for multiple patients. 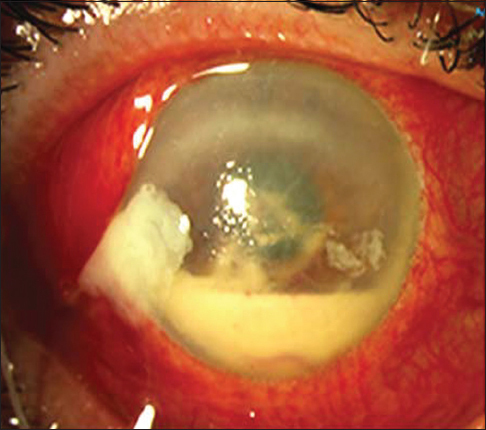 As with any intraocular procedure, endophthalmitis is a dreaded complication leading to severe ocular morbidity and vision loss [Figure 1]. 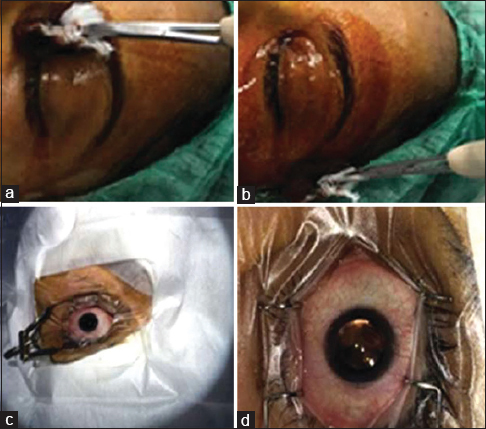 Although the incidence is low  (0.016–0.026%), with dramatic increase in the number of injections performed annually in India, postinjection endophthalmitis (PIE) is a matter of grave concern since multiple patients undergo the procedure in the same operating theater (OT) on the same day which increases the risk of cluster endophthalmitis throughout the country following intravitreal bevacizumab (Avastin ®) and confirmed reports of such dreadful occurrences exist. Since multiple patients undergo the procedure in one sitting, any breach in asepsis, cold-chain or contaminated drug increases the risk of cluster endophthalmitis. One of the major reasons for increase in postintravitreal injection endophthalmitis is the procurement of counterfeit drugs and improper storage of drug/lapse in cold chain when the same vial is used more than once. This is, especially, true for intravitreal bevacizumab (Avastin ®), available as 4-ml vial. Recently, a cluster of 21 patients suffering from endophthalmitis after being injected from a single vial of Avastin ® on a single day was referred to our tertiary care center. A majority of these patients showed Stenotrophomonas maltophilia as the causative agent which was also isolated from the vial and is an emerging nosocomial infection causing endophthalmitis. Thus, to avoid such dreaded complication like cluster endophthalmitis, the best practice guidelines formulated and issued by VRSI, AIOS, and Dr. R.P. Centre (AIIMS, New Delhi) should be followed and the procedure should be carried out diligently with proper pre-, intra-, and post-operative precautions. Prophylactic topical antibiotics: There is a lack of evidence to support pre-, peri-, or post-injection topical antibiotics. In fact, one of the studies showed a trend toward higher incidence. However, a short course of postprocedure prophylactic antibiotic may be used on surgeon's personal experience and discretion. Routine anterior chamber paracentesis is not recommended. 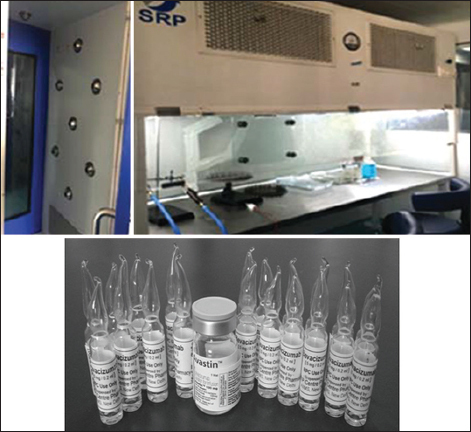 Cold chain should be maintained at each stage (2°–8°, never freeze the vial), especially at dealer's storage facility, transport to the hospital and in the hospital with proper temperature log maintenance. In case facility for above two not available - Pool up to seven patients on the day of injection. Prepare seven aliquots of around 0.2 ml per syringe (one syringe for one patient) inside the OT by single puncture of the vial after proper scrubbing and using aseptic technique. Re-cap the syringes with fresh sterile needles. Keep these syringes on a sterile surface. Only use these for the patients in the same session. Discard the vial - It is NOT to be reused or repunctured. Numerous trials enrolling thousands of patients performed worldwide have shown similar efficacy and safety of intravitreal bevacizumab (Avastin ®) compared to other anti-VEGF. Bevacizumab thus has an added advantage of decreasing the economic burden of treatment by significantly reducing the cost of therapy, especially in our country with limited access to resources by the population. Bevacizumab as an anti-VEGF preparation has been placed in the WHO Model Lists of Essential Medicines. An article on the appropriate preparation of bevacizumab for intravitreal injection by compounding pharmacies has been aptly titled– “Avastin does not blind people, people blind people.” It is essential that we strictly follow the standard guidelines for intravitreal injections and minimize the avoidable complications related to this wonder drug. McCannel CA, Flynn HW, Cunningham Jr ET. Updated Guidelines for Intravitreal Injection. Rev Ophthalmol 2015;7:52-5. Results of the Endophthalmitis Vitrectomy Study. A randomized trial of immediate vitrectomy and of intravenous antibiotics for the treatment of postoperative bacterial endophthalmitis. Endophthalmitis Vitrectomy Study Group. Arch Ophthalmol 1995;113:1479-96. Dossarps D, Bron AM, Koehrer P, Aho-Glélé LS, Creuzot-Garcher C; FRCR net (FRenCh Retina specialists net). Endophthalmitis after intravitreal injections: Incidence, presentation, management, and visual outcome. Am J Ophthalmol 2015;160:17-25.e1. Storey P, Dollin M, Pitcher J, Reddy S, Vojtko J, Vander J, et al. The role of topical antibiotic prophylaxis to prevent endophthalmitis after intravitreal injection. Ophthalmology 2014;121:283-9. Chen E, Lin MY, Cox J, Brown DM. Endophthalmitis after intravitreal injection: The importance of viridans streptococci. Retina 2011;31:1525-33. Garg SJ, Dollin M, Hsu J, Storey P, Vander JF. Effect of a strict 'No-Talking' policy during intravitreal injection on post-injection endophthalmitis. Ophthalmic Surg Lasers Imaging Retina 2015;46:1028-34. Shah CP, Garg SJ, Vander JF, Brown GC, Kaiser RS, Haller JA; Post-Injection Endophthalmitis (PIE) Study Team. Outcomes and risk factors associated with endophthalmitis after intravitreal injection of anti-vascular endothelial growth factor agents. Ophthalmology 2011;118:2028-34. Bakri SJ, Snyder MR, Pulido JS, McCannel CA, Weiss WT, Singh RJ. Six-month stability of bevacizumab (Avastin) binding to vascular endothelial growth factor after withdrawal into a syringe and refrigeration or freezing. Retina 2006;26:519-22. Gonzalez S, Rosenfeld PJ, Stewart MW, Brown J, Murphy SP. Avastin doesn't blind people, people blind people. Am J Ophthalmol 2012;153:196-203.e1. Prof Atul Kumar underwent residency training in Ophthalmology, followed by senior residency at the Dr Rajendra Prasad Centre for Ophthalmic Sciences, All India Institute of Medical Sciences (RPC-AIIMS), New Delhi. He began his luminous academic career as an Assistant Professor at the Retina Unit at RPC-AIIMS in 1987. He further trained in Retina with a fellowship from the University of Maryland, Baltimore, USA, 1991. Very early in his career, he won the Best Scientific Paper Award at the All India Ophthalmological Society Annual Meeting in 1994 and the International Council of Ophthalmology-Nakajima Award. A consummate academician that he is, Prof Atul Kumar has been a Member of the Editorial Board of Indian Journal of Ophthalmology (IJO) for nine years now. Currently he is the Honorary Editor of IJO. Prof Atul Kumar has 236 publications to date. 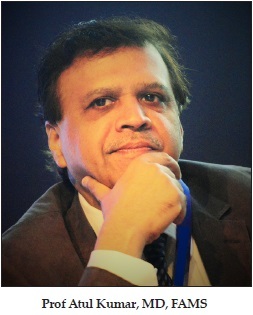 His achievements include Fellowship of the National Academy of Medical Sciences, India, 2006; prestigious Padma Shri Award by the President of India for his contribution to healthcare in the field of Vitreo-Retinal Diseases and Surgery, 2007; Honorary Vitreo-Retinal Consultant to the Armed Forces, 2015; appointed Advisor, Ophthalmology, Government of India, 2016; and BC Roy Award for Medical Sciences, 2016. He is presently the Chief and Professor at RPC-AIIMS, the National Apex Institute for Ophthalmology. In this role, he has envisioned and spearheaded the rapid pace of development of RPC-AIIMS into one of the very best in the World for patient care, academics, research and training. Prof Atul Kumar is a strong opinion leader in Indian Ophthalmology today, and is most apt to take a stand on the current status of intravitreal bevacizumab in India.